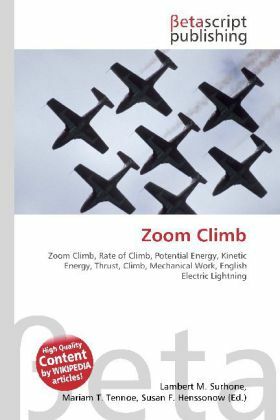 Please note that the content of this book primarily consists of articles available from Wikipedia or other free sources online.A zoom climb is a climb where the rate of climb is greater than the maximum for a sustained climb, as determined from the thrust of the aircraft''s engines. During a zoom climb, the aircraft gains potential energy at the expense of kinetic energy. (This is different from a steady climb, where the increase in potential energy comes from mechanical work done by the engines, rather than from the aircraft''s kinetic energy. )Lockheed NF-104A, 56-0756, zoom climbing with rocket power.In a demonstration of their performance, English Electric Lightning fighter aircraft have sometimes used zoom climbs to climb above a Lockheed U-2 (which cruises at an altitude above the Lightning''s service ceiling), before pouncing on it from above. During the Second World War, MiG-3 pilots utilized zoom climbs and subsequent descents to maintain a speed advantage over German fighters.